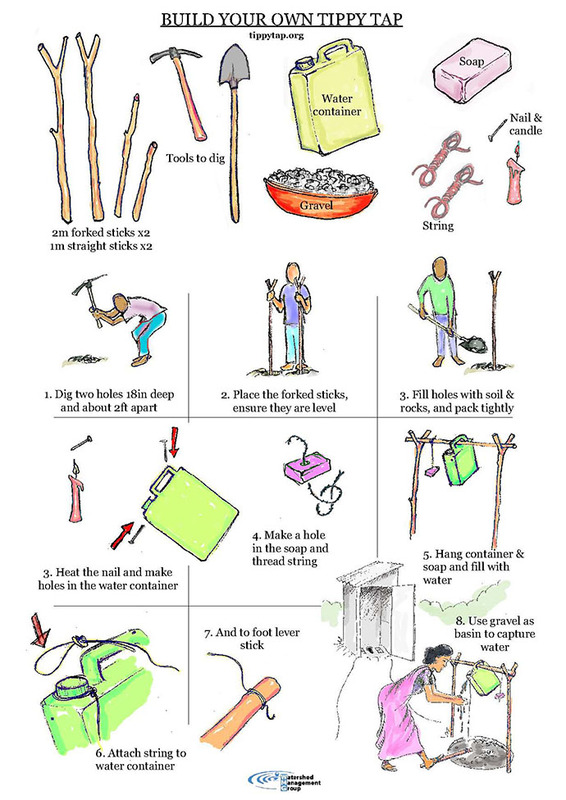 Hygiene and sanitation training are an important component of any water project. Teaching the local community about how diseases are transmitted, and how best to use their new clean water source are essential components to the overall success of a new community water source. Without this education and the changed behavior that follow, diseases will continue to be transmitted unknowingly, and the benefits of the clean water will go unrealized. This activity session includes several shorter components. As teacher, you may choose to pick and choose certain activities or do the entire session. The session begins with a free-write to get students thinking about sanitation in their own life. Often in the developed world, we take toilets and sinks for granted, but this is not the case around the world. This first activity challenges students to do some self-reflection on the issue. From there, students recall their own hygiene training in terms of hand washing. One student then demonstrates proper hand washing technique in order to determine just how much water is needed for a single hand washing. Students are then challenged to determine how much water it would take their families if they were to wash properly at all the appropriate times in a given day. Faced with a realization of just how much water they use, this discussion leads to the need to conserve water in such scarcity situations. The tippy tap, a simple hand washing station, developed for use specifically in the developing world, is then introduced through a video and/or demonstration. The importance of hygiene and sanitation education is enforced in this session through video and follow-up discussion. To close, students are asked to be creative again and become a "volunteer public health worker." Students may choose an assignment, or you can select one for the whole class to actively do. Options include writing a skit, designing a pamphlet, writing a song or designing their own tippy tap. How would your life be different without indoor plumbing? Which is more important to you, your cell phone or a toilet? Why? 2.6 billion people do not have access to a toilet. That's just a little bit less than 1 in 3 people in the world. More people in the world have access to a cell phone than a toilet. Washing hands with soap and water reduces diarrhea deaths by more than 40%. Note: Our "Water Crisis Stats" fact page is available to bring in additional facts. Ask students to recall everything they know about washing hands and write it on the board. What part of the hands has to be washed? When do you wash hands? Have a student volunteer demonstrate proper hand washing technique in front of the class with soap, a pitcher and a bucket to collect the total water used. As the teacher, pour the pitcher over the student's hands. It's important that for this demonstration you do NOT try to conserve water. Be sure to have a towel on hand. Measure the water used in ml. Have students complete the Activity Worksheet in the chart below for their own family using the number you just figured as the estimated water. In general people will estimate somewhere between 25 and 60 washes, but there are no right/wrong answers. Note: This is an actual exercise used in some sanitation and hygiene programs to make people aware of how many times they should be washing their hands. In many communities this is a brand new concept. It may be a good reminder for your students as well. Once students have done the math, point out that every 20 Liters is another trip to the well. Point out that what this would mean is that if the family washes their hands properly, it could actually keep a child out of school to go and collect that water. Explain to students that because of this, water saving solutions, like the tippy taps that you'll explore next, are a necessary part of the developing world. How much water does it really take to wash your hands? How many times a day does a family need to wash their hands? How much water do you and your family use in a day? Explain to students that water saving solutions are necessary to keep kids in school, and women from having to spend all of their time walking to get water just for hand washing. One of the simplest solutions is the tippy tap. The tippy tap is a hand washing station that allows people to use small amounts of flowing water (40 mL instead of 500mL+) and soap instead of contaminating a whole bowl of water. and discuss briefly their reactions. You may also want to give out the handout on the next page for students to follow along. As students discuss. explain that contrary to popular belief, soap is available and present almost everywhere in the developing world. It is simply thought to be more of a priority for laundry, dishes, and bathing than basic hand washing. Further, where soap is not available, many places will use ash for these tasks. All of that being said, basic hand washing can cut down on diarrhea rates by more than 40%. Further, the simple design of the tippy tap is vital to its success for three reasons. 1. Children can be taught how to build and operate it. This also means that they can teach their parents. 2. The hands free design means that no germs are transferred between users. Note: Students may wonder why education is important. The video "I am a Leader. I am Powerful." illustrates how this principle of empowerment and knowledge works to change community behaviors. It is a critical tool to increase the likelihood that clean water is used effectively in a community. You can view it at the very bottom section of our home page: http://www.thewaterproject.org/; or here at http://vimeo.com/22845906. Have students choose an activity from the list below. Groups may be needed for some activities. We've seen people use all sorts of things - like a hollowed out gourd with a pen casing - to create tippy taps from whatever materials they have available. Using only materials in the classroom and/or your home, design your own tippy tap. If you actually make it - take a picture and send it to us! We may re-post it! You may want to have students consider getting involved in solving the water crisis. One possible activity is a Water Challenge (http://thewaterproject.org/thewaterchallenge.asp) or other fundraising campaign where the class teams up to raise awareness and donate to a clean water project. 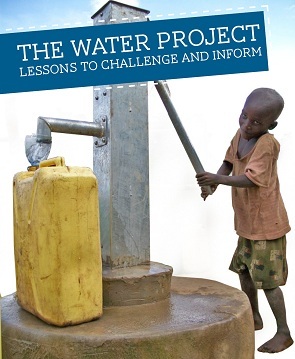 See http://thewaterproject.org/start-a-fundraiser.php for downloadable ideas and a Media Kit. All statistics and facts from this section come from Tippy Tap: http://www.tippytap.org/the-stats/ and http://www.tippytap.org/the-tippy-tap/. Video courtesy of Living Water International.